With the launch of the Samsung Galaxy Tab S2 Nook behind us and the Nook Glowlight Plus expected to appear in the next few weeks, it looked like B&N had all its hardware out in the open. But no, B&N has surprised us again. Barnes & Noble has quietly alerted Nook app developers to start getting ready for a new tablet. 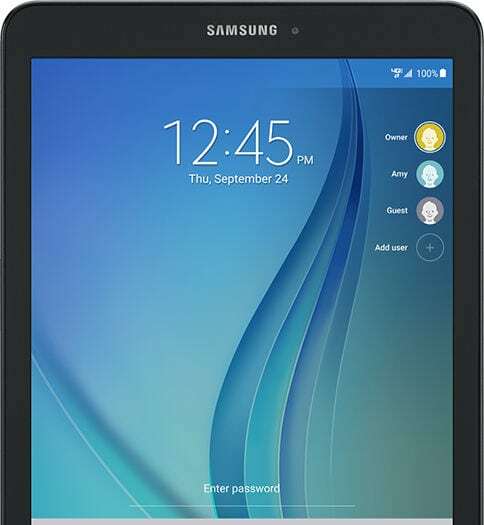 The retailer hasn't named the tablet, but they do mention the model number, screen resolution, and that this is a Samsung tablet. 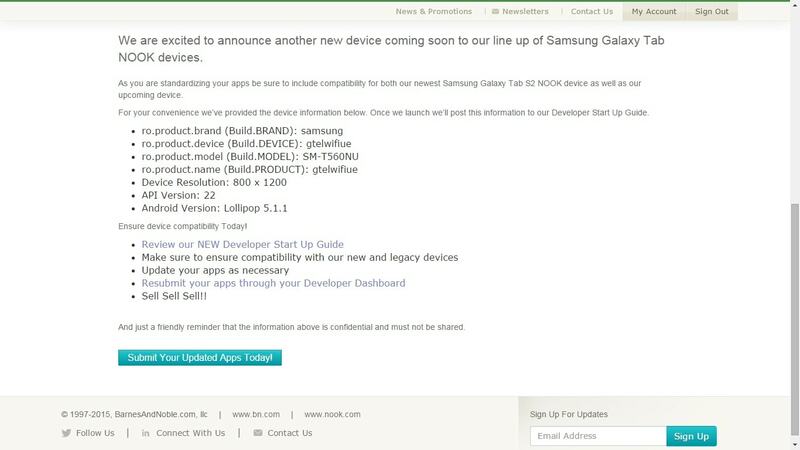 B&N's next Nook tablet will carry the model number SM-T560NU (see the screenshot at the end of the post). Assuming that the model number matches up with Samsung's existing devices, we're talking about the Samsung Galaxy Tab E 9.6. Edit: And now I feel stupid. The page on the B&N website is named "samsung-TabE". So yes, it's the same device. Announced in June, the Tab E 9.6 is larger and much cheaper than the Tab S2 8.0. B&N has revealed that the Tab E 9.6 sports a screen resolution of 1,200 x 800 (just like on the Fire HD 10), and the rest of the specs are similarly unimpressive. To be clear, we don't know for sure that the model numbers line up, but if they do then this is going to be more of a budget Nook tablet. The Tab E 9.6 runs Android 5.1.1 on a 1.3 GHz quad-core Spreadtrum SC7730SE CPU with 1.5GB of RAM, 8GB of storage (plus 128GB microSD card support), and two cameras (2MP and 5MP). This tablet has Wifi, Bluetooth, GPS, and an accelerometer. It measures 8.5mm thin, weighs 490 grams, and comes with a 5Ah battery which specced to give it a battery life of 7.5 hours. 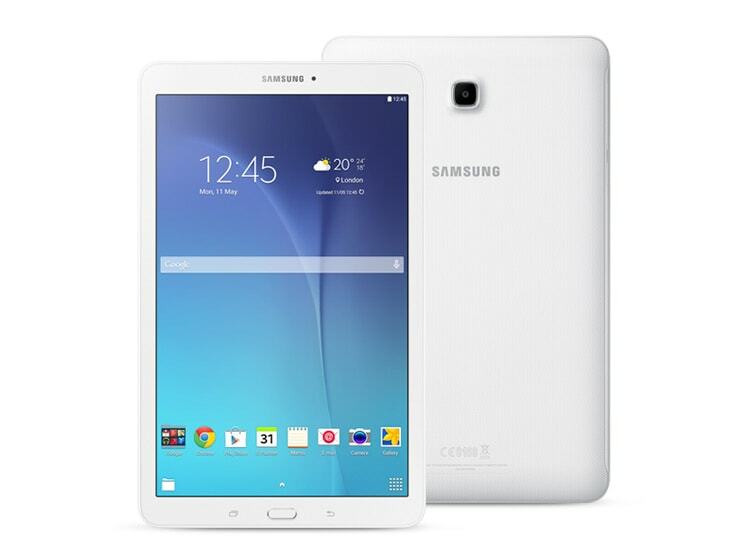 The Tab E 9.6 launched in June, shipped in a few select markets in July, but has only just become available in the US. It's not on the retail market yet, but Verizon carries a 4G model that costs $329 and comes with 16GB of storage and a 7.1Ah battery. B&N's version will likely have Wifi and not 4G, so it will probably cost in the range of $249 to $279. Of course, this is pure speculation. All we have are a few details, including a screen resolution which does not match up with the Tab E 9.6 specs. But I am reasonably confident that I have identified the correct device. So what do you think of the tablet? I didn’t notice when this was released; it seems to be a successor to the TAB 4, with the only significant difference, in this iteration, being the aspect ratio. I suspect B&N have lots of TAB 4 tablets to be cleared, so they could discount them and they could be good value.